Jumping back to this series of images from October. My photo day had been going very poorly with nary a click of the shutter. 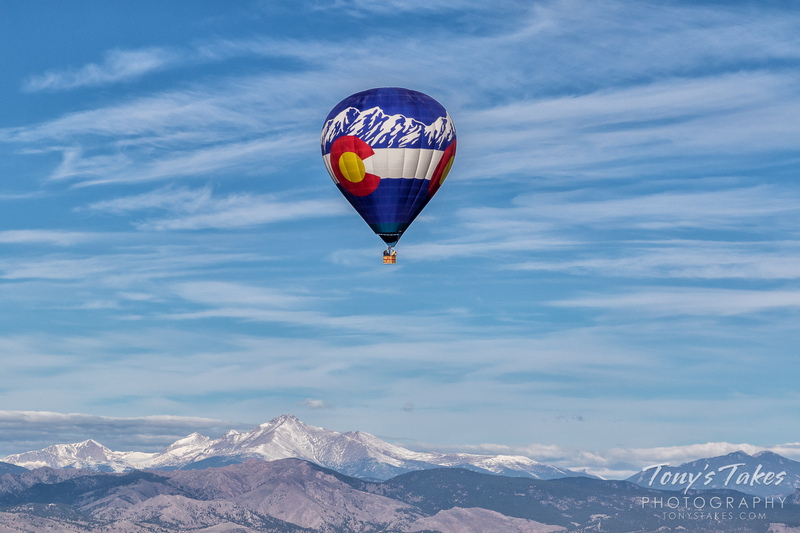 I was about to give up and head for home when I came across this balloon flying across the Front Range. A recent snow had capped the Rocky Mountains in white and it was an extraordinarily clear day. I spent more than an hour racing after the balloon grabbing dozens of images of it. Here, it had gained some altitude and below and slightly to the left, the monstrous 13,911 foot high Mount Meeker stood tall and proud. Many folks think it is Longs Peak that they see from the Denver area and look toward Rocky Mountain National Park but, in fact, Meeker stands in front of Longs when viewed from the east.